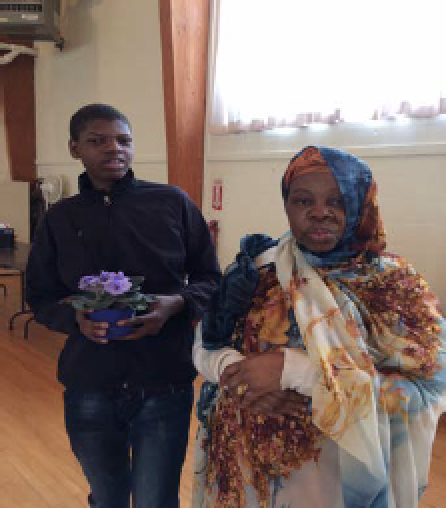 Bakhita returned safely home on April 30th to Portland Maine accompanied by her 16 year old brother after his successful visa interview at the American Embassy in Nairobi, Kenya and a 48 hour journey which included layovers and a final bus trip from Boston. Augustino has reunited with their mother, Mary, in Bakhita’s home leaving four family members in Cairo, Egypt. The good news is that they will process through the system together as a unit when their number is called by immigration for their visa interview (must also be done in Kenya) They are: Bakhita’s brother, Francisco, and their sister, Severine with her two children Gloria, 11 and 5 years old Christina (who has spina bifida,which requires medical treatment in which the Barbara Bush Medical Center in Portland Maine specializes). Bakhita is wasting no time as her brother Augustino is already learning English at home with a literacy program she set up through the Portland school department. The children have been without schooling because of their country’s war and their refugee status. To get an idea of what has happened in So. Sudan, google “The Good Lie” and watch the 2014 movie (with academy award winner Reese Witherspoon) which tells the true story of war orphaned So. Sudanese children, their 1000 mile walk across the sub Sahara to safety and what became of them. This happened in the second civil war between northern Sudan, predominantly Muslim, and south Sudan, predominantly Christian, when the religious culture and autonomy of the South Sudan Christians were being repressed. 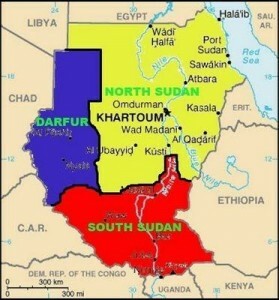 Eventually South Sudan became an independant nation in 2011. The country of South Sudan is blessed with abundant natural resources including oil, minerals, precious metals and fertile land but suffers from poor governance and corruption. Two years after its independence civil war broke out again when the president (Kiir)of the new republic ousted his vice president (Machar). Those loyal to the former vice president became rebels fighting the government army. Later, different ethnic groups began to fight each other. The third So. Sudan civil war is now in its fifth year killing tens of thousands of men, women and children through genocide, famine and disease, creating the largest humanitarian crisis since the Rwandan genocide in 1994, with 4 million people displaced by violence, 3 million refugees in neighboring countries(two-thirds who are children) and 7 million requiring humanitarian assistance. Atrocities by all parties are rampant with mothers being raped, their husbands killed and their children stolen before they can get to safety. Humanitarian aid within the borders has been blocked by fighting and relief workers there are not safe. to read her article in the Washington Post “South Sudan has failed its children. We must not”) She is asking for an arms embargo on South Sudan and a deadline of June 30 for warring sides to end the fighting or face specific sanctions during a recent emergency meeting of the UN Security Council. Outside donations can still be given on the go fund me page (www.gofundme,com/7uuepw) set up by Kim Tison SFO or sent to the Regional Treasurer. Our regional newsletter, “The Herald”, which has articles about the regional apostolate can be used as a reference. Presently our coffers are depleted and the threat of eviction is real with no lifelines for our family who live in seclusion in a Cairo apartment. (recall the Cairo church bombings, Easter 2017). We still need $1500 a month to cover their rent and food while they wait for their visa interview appointment (the last step of the immigration process) Lastly, we ask all to pray for the success of this apostolate individually and when you come together in fraternity, especially to St.Josephine Bakhita, patroness of Sudan, called the “Universal Sister” by Pope St. John Paul and “Our Lady Undoer of Knots”. Bakhita and her family cannot find adequate words in their language or ours to express their gratitude, but may Our Lord Jesus, in the Refugee, bless us now and when we fold up our tents to go to our eternal Home. Below is a picture of Augustino (holding African violet) and his mother, Mary Saabino at the Franciscan Guest House auditorium, Kennebunk, Maine, where they met secular Franciscans on retreat in May. In his message to the United States Congress in September of 2015, Pope Francis called for compassion for the refugee and immigrant. In a time when the refugees are fleeing from dangerous and desperate conditions in their own countries, the Pope is calling for us to “view them as persons, seeing their faces and listening to their stories, trying to respond as best we can to their situation”. The numbers of refugees is overwhelming. But St. Elizabeth of Hungary Region of the Secular Franciscan Order has been blessed in finding a specific South Sudanese family through our outreach to young people in the Portland, Maine, Diocese. We have befriended a young woman, who still has five family members in the war-torn country of South Sudan, her two brothers, aged 28 and 15, her sister, aged 30, and her sister’s two little girls, ages 4 and 11. The civil war in South Sudan has resulted in wide-spread shortages of food and clean water, and the constant threat of violence and genocide. Outbreaks of cholera and malaria are widespread. One of our friend’s sisters was killed by a suicide bomber while shopping in the marketplace in Juba, the capitol city. Her 4-year-old niece was born with spina bifida, and goes without medical care. 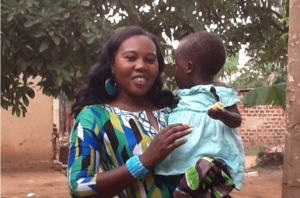 Owing to the efforts of Kim Tison, OFS, who became her sponsor, our Sudanese friend’s mother, Mary, arrived in the United States on August 6th, 2015. Now she can bring the rest of her family here under refugee asylum status. But first we need to get the family out of danger in South Sudan and bring them to Nairobi, Kenya, where they can begin the process of obtaining the documentation needed to come here to the United States. St. Elizabeth of Hungary Region has already provided the money for transportation from South Sudan to Nairobi, and funds to secure housing there. But funds are still needed to get DNA testing to prove that they are related to Mary (no birth records are available in their country). They must also pay for medical checkups, visa processing and visa fees as well as plane fare from Nairobi to Boston. The estimated budget for these expenses is over $20,000 – much more than the family could ever hope to raise on their own. The opportunity to keep this family intact, and to get them out of danger is such a great blessing to us. We are asking all our Fraternities to support this effort in whatever way possible. To donate to this worthy cause, you can go to the go fund me page http://www.gofundme.com/7uuepw or send a check via your fraternity to the St. Elizabeth of Hungary Region’s Treasurer.